to generate a list of all educators in one place. I found out about all this through @PrimaryPete_ who explains all of this far more eloquently than me on his blog here. 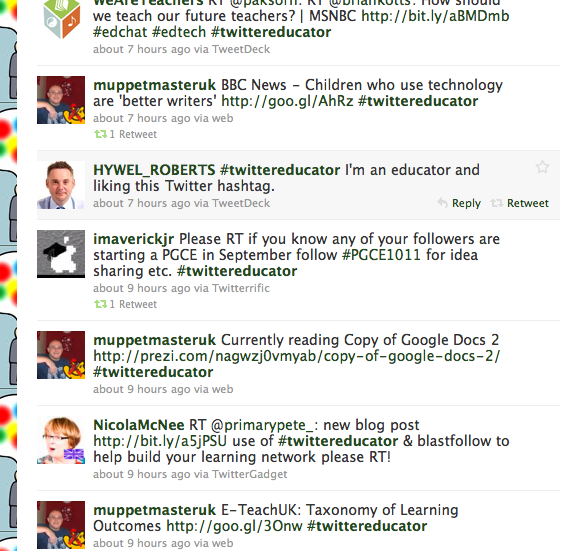 Basically, the hashtag sets up a blastfollow site (a shared search page), so that when you tweet, you include #twittereducator in your tweet, your tweet will appear on the list, along with your Twitter name and you will be able to connect with even more ‘tweeps’ from the fabulous range of global twitter-educators. As a result, you will then make even more learning connections to enrich your Personal Learning Network just by going to this page. It has worked really well for me this week, and I wanted to reflect on this by including just TWO examples (of many) that demonstrate the impact of this #twittereducator project for me. I’ve framed my statement with a simple impact-sentence stem that I use when undertaking focused reflective practice with learners (educators & students alike) to talk about key influences and influencers for them and to analyse the impact these have had on their learning. some excellent action research around the Key Competencies. These people and resources all connect brilliantly with the learning that I am involved with at the moment, looking at the relationship between skills, knowledge & understanding and dispositions in the secondary curriculum. It will be interesting to hear about the impact that the blastfollow has had on other twitter-educators over the next few weeks, but thank you to the whole educator-community for being so innovative and collaborative when it comes to harnessing the power of twitter once more. ‘…it’s all about learning…’ so Inever really stop. Great review of the #twittereducator experience. I think it is great! Such fun & really beneficial for us educational bods eh! Thanks for educating me because am going to start using twitter,it sounds exciting and interesting.Great work. Great responses – seems the #twittereducator blastfollow has really taken off! Definitely needs repeating!